For the last three months I have been blogging about the distressing condition of the Presbyterian Church (U.S.A.). Yet, given all of my frustrations and criticisms, I have not given up on the Church. Oh, I’m not sure what will come of the PC(USA), but no matter what happens with my denomination, I’m solidly committed to the Church of Jesus Christ. So I’ve decided to do a blog series on the church. Specifically, I’m going to talk about the church as the body of Christ. Now I realize this isn’t a new idea for most Christians. In fact, the notion that the church is like a body is almost 2,000 years old. But I think I’ll be able to say some things about the church as the body of Christ that aren’t commonly understood, even by Christians who think they know all there is to know about this subject. Moreover, I believe there’s much to be gained by revisiting this common image from the New Testament. As we think about what the church should be, and as some of us try to figure out the role of denominations in the church, we would do well to return to the biblical basics. And little is more basic than the simple affirmation that the church is the body of Christ. But before we get to the specific topic of the church as the body of Christ, we need to celebrate a birthday. It must have been quite a scene. The streets and squares of Jerusalem teeming with Jewish pilgrims from throughout the world. The tempting smells of food hawked by street vendors. The din of raucous voices shouting in dozens of different languages all at once. A thrill in the air as the festival of the spring harvest was about to begin. And then, above the bedlam, clear voices were heard, strong and joyous voices, voices proclaiming the wonders of God, voices exclaiming in numerous languages, yet somehow strangely harmonious. As the crowds rushed to see what was happening, they gathered around a small band of Jewish pilgrims, men and women whose clothing and accents gave away their Galilean origins. Oddly enough, this rather unimpressive bunch from a small geographic region seemed to be speaking in all the languages known by the crowd. Each pilgrim heard the praise of God in his or her own tongue. The speaker, whose name was Peter, went on to say some disturbing but wonderful things about someone named Jesus, a man once supposed to be God’s savior for Israel, but who had been put to death by the Jewish and Roman leaders of Judea seven weeks earlier. Yet, Peter claimed, Jesus rose from the dead as proof of his divine appointment as Lord and Messiah! At first the crowd didn’t know quite how to react. Were they being accused of something? Or was this some sort of invitation? A few felt their hearts moved by Peter’s announcement. “What should we do now?” they shouted emphatically. At first just a few came forward to accept Peter’s offer and receive baptism. But then others followed. Soon a mass of humanity crowded around the Galileans. By the end of the day, about three thousand had heeded Peter’s call. They turned away from their sins and trusted Jesus for salvation. They were baptized as a sign of their new faith in him as God’s anointed Savior. On this day some 2,000 years ago, the church was born. We call the church’s birthday Pentecost, which is an English version of the Greek word meaning “fifty.” The Jewish harvest celebration occurred fifty days after Passover, hence Pentecost. 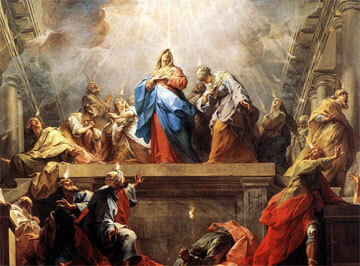 (Photo: “Pentecost” by Jean Restout II, 1732). So those who welcomed his message were baptized, and that day about three thousand persons were added. They devoted themselves to the apostles’ teaching and fellowship, to the breaking of bread and the prayers. Awe came upon everyone, because many wonders and signs were being done by the apostles. All who believed were together and had all things in common (Acts 2:41-44). Notice that the new believers joined themselves promptly to the band of Jesus’ followers. They continued to hang around the apostles, those who had been sent by Jesus to bear witness to him, in order to learn more about their faith. They also devoted themselves to “fellowship” (koinonia in Greek). The first believers began to participate in that intimate fellowship with God and God’s people that is so essential to Christian living. This passage accentuates the human dimension of koinonia. The new converts shared intimate fellowship with the apostles and, by implication, with others who believed in Jesus. Notice that all of these folk “met together constantly” and “shared everything they had” (Acts 2:44). Their fellowship was far more than commenting on Peter’s Pentecost sermon over coffee and bagels after church. They shared their possessions, prayers, and praises (Acts 2:45-47). They enjoyed meals together, during which they remembered Jesus’ death on the cross as he had instructed his followers to do. The earliest Christians seemed to sense, and no doubt were taught by the apostles, that what they had just done by believing in Jesus should be fleshed out in community with others who had done the same. They didn’t simply add some new religious beliefs to their worldview and go on with life as usual. Nor did they immediately withdraw from the crowd and engage in private devotions. Rather, they embraced the community of other Christians at the same time as they were embraced by that community. They were adopted into a new Christian family. We Americans, on the contrary, have had a long history of thinking of religion in general, and Christianity in particular, as mostly or exclusively a personal, private, individual matter. I’ll say more about this in my next post in this series. This is a great topic. I’m looking forward to reading more. There are a couple of things I’m curious about that I hope you’ll address. 32All the believers were one in heart and mind. No one claimed that any of his possessions was his own, but they shared everything they had. 33With great power the apostles continued to testify to the resurrection of the Lord Jesus, and much grace was upon them all. 34There were no needy persons among them. For from time to time those who owned lands or houses sold them, brought the money from the sales 35and put it at the apostles’ feet, and it was distributed to anyone as he had need. To a western Protestant in 2008 this seems like very radical behavior. In fact, when we see a religious group today exhibiting this behavior we are usually quick to bring out the “cult” label. Our general approach to Christian stewardship today seems to be that a tithe of 10% is a reasonable goal. But what about the other 90%? Sure, we acknowledge it to belong to God and to be entrusted to our care, but we don’t put everybody’s wealth together into one big pot to be “distributed to anyone as he had need” the way I read it in Acts. And look what happened to Ananias and Sapphira (Chapter 5) when they sought to hold back a little for their personal use. I’m very curious about how to connect the dots between the Acts description of stewardship and how I ought to understand what God expects of the Church and of me in 2008. Also, I’m very interested in the topic of denominationalism. I know you covered denominations in an earlier post series from the perspective of the roles they perform in the Church (i.e. what’s good about them), but how did we get from the one common Church of Acts to the countless numbers of different groups that make up the Church today? Is scripture neutral in this regard, does it lead us toward a more Roman Catholic notion of a single Church? By the way…I guess in the Book of Acts all property, whether title was lodged in a corporation, a trustee or trustees, or an unincorporated association, and whether the property was used in programs of a particular church or of a more inclusive governing body or retained for the production of income was held in trust nevertheless for the use and benefit of the apostles. I suppose the property trust clause has some biblical basis after all. Mark, I look forward to the rest of this series. Ray, I think you’re missing some things on Acts. First, they didn’t disolve all private property; instead they rounded up as much cash as they could for the purpose of taking care of the poor. This isn’t communism; it’s radical charity — and we should immitate that to the best of our ability. 3rd, “all property… was held in trust for the use and benefit of the apostles.” Huh? It was used by the apostles and later deacons for the benefit of the poor. Apologies to Dr. Roberts - I didn’t intend to hijack his platform with a diversion into politics, social policy and economics. The question was meant to be serious, though, because I truly do want to understand how our modern concept of stewardship compares to that described in Acts. The NIV translation does not say “rounded up as much cash as they could”, it says “no one claimed that ANY of his possessions was his own” and “they shared EVERYTHING they had” (and you are probably correct about the purpose of the funds, but the purpose is implied, not stated). Later it says that from time to time capital assets (land and real property which are not easily dumped into a common coffer) were sold by those who owned them, and the proceeds were put at the apostles’ feet and were distributed to those in need. If I seem to be passing judgement on this arrangement, maybe I’m not communicating effecively. I’m just asking why our notion of faithful stewardship differs so much from what is described in the 4th and 5th chapter of Acts. We seem to operate on the 10% rule, whereas they saw it as nothing less than 100%, at the risk of dire consequences. Regarding Ananias and Sapphira, I’ll concede your point. Finally, about the last part of my comment, I knew that it sounded bad when I wrote it, but my finger hit the submit button anyway. I figured somebody would call me on it. In an attempt to be humorous (but with a point), I simply substituted “the apostles” (which is how Acts 4 describes the early church’s organizational structure) for “the PC(USA)” in our denomination’s property trust clause. It seemed to fit. Anyway…thanks for your comments. I’m hopeful that the rest of this series will give me a better understanding of what it means to be part of Christ’s body in my time and in my community. I’ve always been curious about some of the economic realities surrounding the early church. I assume that early Christians had jobs much as the rest of the community did, but I confess that I know little of the work-life of first century Israel. I assume that it bears little resemblance to the 9-5 workday that most Americans would assume (actually, where does that 9-5 thing come from? My work schedule has always been 8-5, with an hour for lunch, totaling 8 hours in a work day. I assume most folks have something more similar to my experience than to the “9-5″ ideal…). Without trying to make too much in the way of excuses for myself, I find that my ability to volunteer at my local church as much as I’d like to is diminished by my need to earn an income for myself and my wife (which even still isn’t really enough at the current cost-of-living, but I digress). I assume that even the earliest Christians had their ability to serve affected by the realities of day-to-day life, also, but would be curious to hear more on this matter. I have been so bless by coming across your blog. I want you to know that I enjoyed this post as well as your blog. 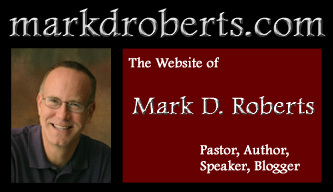 I have added your blog Mark to my list of favorites. I want you to know that you will be in my thoughts and prayers daily. I will be praying for you and your ministry. I know God has great plans for your life. You are making such a Kingdom difference. Keep it up! I just recently discovered this site, too, and it is indeed a blessing! Thank you, Dr. Roberts, for all the effort, prayer, and time you put into this. Speaking of time, and not to get too diverted: I think 9 to 5 is the common workday on the cities of the two coasts. As one who grew up in the East, I had a bad time adjusting to the 8 to 5 workday at my first professional job in the Rocky Mountain West. (Maybe it’s the reason I came back East so soon after!). Fortunately, I was aided in my arguments by the release of the Dolly Parton/Jane Fonda/Lily Tomlin film “9 to 5” just at the time I was trying to make my point to my overworked colleagues. Great topic, Mark. Just a few quick notes: I believe the house the believers were meeting in on the day of Pentecost was the Temple in Jerusalem. “The House” in Hebrew meant The House of God much as the White House refers to the office complex of the American chief executive. In Jerusalem, where most dwellings were small, only palaces could hold 120 people. On this big feast day the Temple would be the natural place for worshipers to gather. Also when I lived in Jerusalem and help excavate the area just outside of the Temple mount, I saw many mikvaot or ritual baths. It seems most likely to me that these were used to baptize 3,000 people by immersion - unless one contends that they were all Presbyterians and were content with sprinkling.